For me, music has always been something very personal. I grew up listening to classical music and playing the piano. 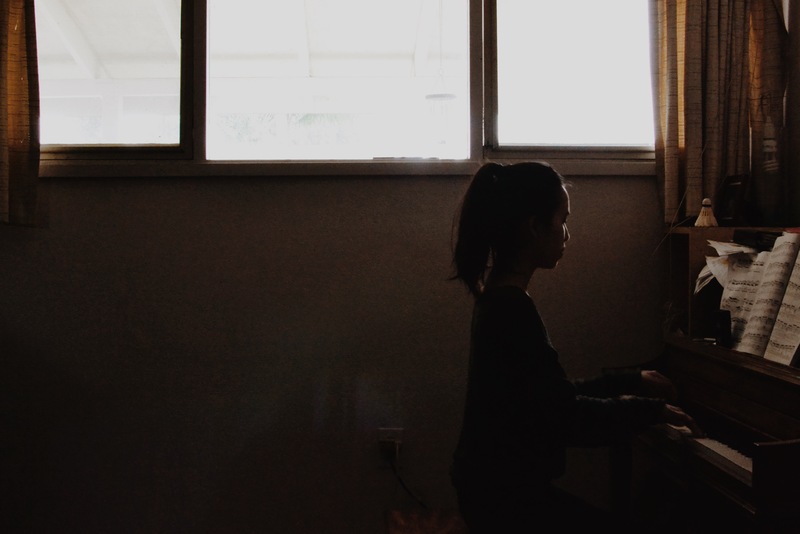 Though I do enjoy sharing my playing with other people, I mostly just love playing the piano when I’m alone – I don’t have to worry about making a mistake or if my audience likes the piece. It’s simply for myself to free my mind and my creativity. When playing or listening to music, even if I’m alone, I don’t ever really feel “lonely”. To see more work by Beatrice, click here. Amanda: I think this image does a wonderful job of capturing solitude. The distance in between the subject and the viewer creates a natural separation. The warm color tones and underexposed aspect add to this sense of quiet comfort that it seems you tried to convey. To make this photograph even more powerful, I think it would have benefited from decreasing the whites and highlights coming from the window. Alternatively, having the source of light be a gentle glow from a lamp might have worked since the window is large and takes up the whole frame. I noticed the little badmitton birdy sitting on the piano and cannot decide how I feel about it. On one hand, it seems distracting. On the other hand, it’s quaint yet doesn’t seem intentionally placed. Overall, a very beautiful photo! Jacquelyn: If I were to describe “Beatrice” to others, I would present this photo as a foundation for your personality, interests, and values. Your photo perfectly captures your unsocial life in one shot. The lighting and overall feeling of this picture are my favorite aspects; the daylight gently illuminates the withered musical scores and your concentrated profile, while the rest of the room is sheathed in a solemn, but calm darkness. You cleverly positioned the piano, drawing my eyes to a specific part of the photo, rather than the whole thing. To me, this is one of your strongest, most poignent pieces of work yet. Even better, it not only reminded me of my own experience practicing the piano, but also brought me back to our memorable time in Music Theory together! Amazing job!! Mary: I love this photo. Even without knowing the prompt or reading your artist statement, it is so easy to understand that this is a photo of enjoyed alone time, peaceful solitude. It is warm and calm. Even with the choas of the music pages and the badminton birdy perched on the piano, the room reads relaxed through the lighting and your expression. I think this may be one of my favorite TCP submissions. Posted in #5 - The Unsocial Life, BeatriceTagged alone, collaborative, collective, music, photographer, piano, project, project 5, solitude, solo, the photograph collective, unsocial lifeBookmark the permalink.